As a kid, whenever my father would read a book of mine (I read a lot of Louis L’Amour and history books), he would mark his plan place in the book by tucking the outer edge of the page into the spine, leaving a vertical crease down the middle of the page. I despised that. I could not understand why someone would destroy the nice, crisp pages of a book. I’ve never been overly guarded about my books. But for most of my life I treated them like library books. Don’t break the spine. Don’t mark on the pages. Don’t use it as a drink coaster (another of my father’s vices). During college, I developed [the] habit of marking a textbook’s important passages, but that was merely a habit of survival; plus, I never viewed the textbooks as belonging in my personal library. 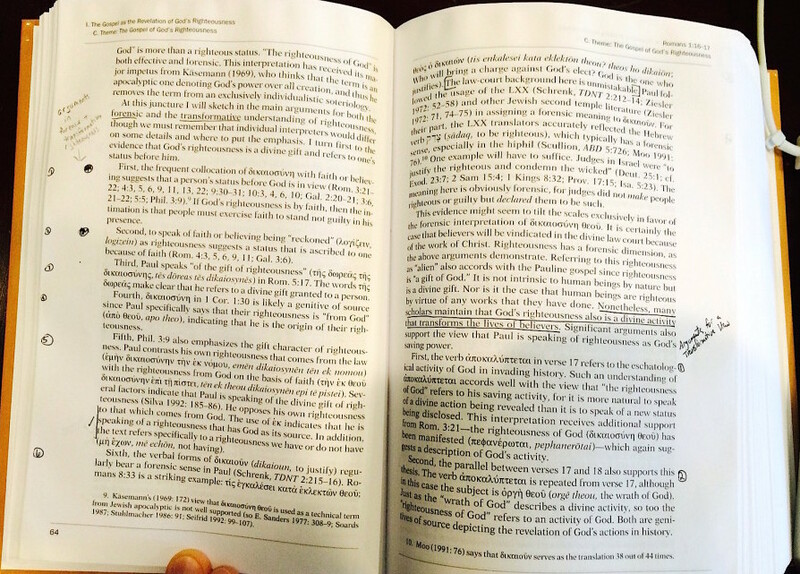 My own markings in my copy of Thomas Schreiner’s commentary on Romans. In 2008, though, I read Mortimer Adler’s How to Read a Book. Adler recommends marking in your books. He sees it as a part of digesting the book. He wrote an essay called, “How to Mark a Book”, in which he recommends a variety of markings in the books you read. After reading that book, I began making an assortment of markings and annotations when I read. Unless I’m reading fiction (or [a book on] on my Kindle Paperwhite), I always read with a pencil or pen. Record Your Thoughts: Almost everything you read elicits some response or thought to it. Maybe you like what was said. You disagree. You agree. You find it important. You compare it to something someone else wrote. Regardless, all these thoughts can (and should) be recorded. The easiest and most efficient way is to make some type of notation in what you are reading. Mark Important Words, Phrases, and Sections: If you are reading a book that you might reference later, or even just want to be reminded of some of its parts or claims, you can mark the important words, phrases, or sections. Then, if you are rereading the book, just skimming it to refresh your memory about it, or searching for a fact or quote that you vaguely remember, you can quickly scan the important parts of the book. Enable Deeper Rereadings: If you plan to reread a book, marking what you read and writing down your reactions can enable you to more easily continue your engagement with the book the next time you read it. If you reread the book months or years later, you might forget many of your first impressions. This means that, in some sense, you have to start over in your engagement with the book. The old confusions will be just as confusing. You questions will remain questions. Your second impression could be identical to your first impression. But if you reread the book and are able to attend to your markings from the first reading, then you can begin where you left off. Maybe the second reading of one sections clears up a confusion you had marked in a later section. Maybe you see an old objection that you had, and your rereading can be more attentive to how the author might address your objection. For Posterity’s Sake: I’ll talk about this more at the end of this post, but whoever inherits your books can access your thoughts about the book. If any of your kids like to read –– or if you think they’d just be curious to see what you found interesting and what you thought on different subjects –– then it can be worthwhile to do that. I work with someone thatwho has the blessing of inheriting many of his dad’s well-worn and marked-up books. I know he feels a connection to his father when he sees what his dad marked in those books. People at Oxford University Do It: Or, at least, that is what Lauren Collins writes in an article entitled “Oxford’s Marginalia Obsession“. Is there a better reason to do something intellectual than this? I’d say, simply, whatever you find most useful. You mark important passages. Points of agreement and disagreement. You write your thoughts in the margins. You might summarize an argument at the bottom of the page or summarize a chapter on its last page. There are many options. Underlining (or highlighting): of major points, of important or forceful statements. Vertical lines at the margin: to emphasize a statement already underlined. Numbers in the margin: to indicate the sequence of points the author makes in developing a single argument. Numbers of other pages in the margin: to indicate where else in the book the author made points relevant to the point marked; to tie up the ideas in a book, which, though they may be separated by many pages, belong together. Circling or highlighting of key words or phrases. Writing in the margin, or at the top or bottom of the page, for the sake of: recording questions (and perhaps answers) which a passage raised in your mind; reducing a complicated discussion to a simple statement; recording the sequence of major points right through the books. I use the end-papers at the back of the book to make a personal index of the author’s points in the order of their appearance. Check Mark: If I agree with significant point, I put a check mark. Dash: I put a dash beside something that needs to be remembered but isn’t a conclusion or a significant statement. ‘X’: If I disagree with something an author writes, I’ll put an ‘X’ in the margins next to the section. If it would not be obvious on rereading that section to know what was my disagreement, then I write a brief note about why I disagree. Star: If the author makes a significant statement –– whether or not it is significant to me –– then I will put a star beside it so I can easily find it. Question Mark: If something is said that is either confusing or I’m not sure what I think think about the statement, I put a ‘?’ in the margins next to it. Words/Sentences: I regularly write any other important comments next to the section. There is no correct system of annotations and marginal markings. Just do what works best for you. If you are going to mark in your books, you should probably think through whether you’ll use a pencil or a pen, and whether you’ll use a highlighter. I am currently using a pencil. I have essential tremors, so I have poor fine motor skills. I easily make errant marks or write my letters too scrunched up. So I need to erase it. But I use a 0.5mm mechanical pencil. I hate the thick, uneven lines that dull conventional pencils make. I have used pens frequently in the past. I do it for two reasons: one, the darker ink stands out more to me, which I like. I also don’t like the way that pencil markings fade and the way the pencil mark can easily rub off onto the opposite page while the book is closed. What about highlighters? I’ve used them a few times in my life. No much, though. They wear out too much. The bright neon colors are too startling, too distracting. I don’t want my markings in a book to be the focal point of the page, but highlights draw my attention to them. I find highlighting more efficient than underlining, though this is largely due to my shaky hands and the great difficultly it takes for me to draw a line under a sentence rather than swerving up and down and crossing out words. But I still choose not to use highlighters. Won’t This Destroy the Books? But if by “destroy” you mean that the book will lose its usefulness to you, then the answer is no. It won’t. In fact, if you mark judiciously and intelligently, the book can become more useful for you. After all, you can pick up any books you’ve read and annotated, and then within a quarter of an hour, you can be reminded of the important passages in the book and your thoughts on the book’s central premise. If you are in a job where you regularly need to access information that you’ve previously read, then this is extremely valuable. 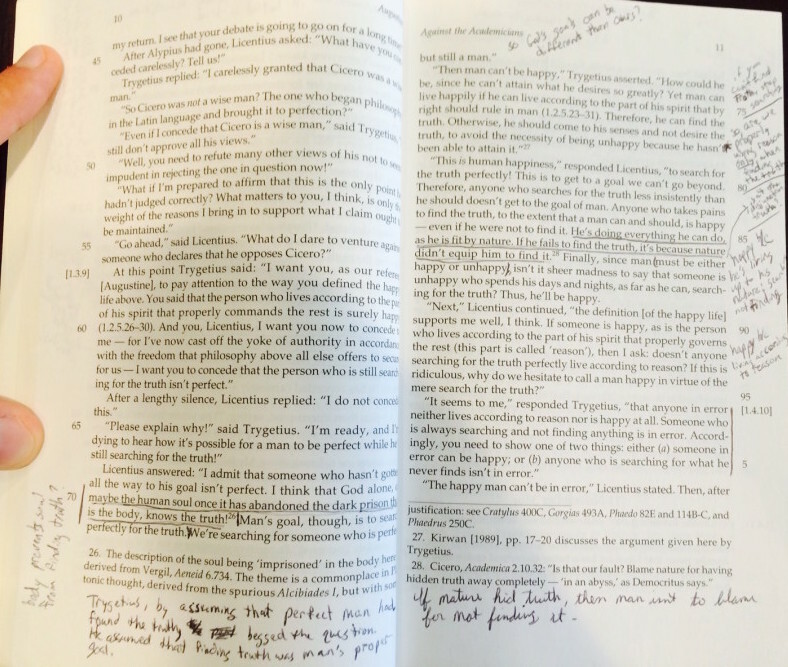 Or, if you reread books, annotating them can be valuable. When you reread, you get to engage not just the author’s views, but your first reflections on them. This leads to a deepening of your engagement with the material of the book. So, no, it won’t destroy the book. Plus, there is something about writing books that, while not eternal, allows my thoughts on minor subjects to live on. For me, one of the attractive benefits of marking in my books is that I am leaving a record of what I find significant in what I read and my thoughts about what I’ve read. I hope my children are avid readers; my oldest son, who is five years old, already reads a lot. Reading and thinking have, and will continue to have, a gigantic role in my life. I won’t pass on sports memorabilia or cars or golf clubs or any wealth to my kids. I have no interest in the first three, and I’ll never build wealth as a minister. But I find it attractive that a few years after I die, my children and grandchildren can look through books I’ve read and see what I found significant, what I agreed with and disagreed with, and so on. I doubt I’ll live on in what I write. I’m not an excellent enough writer to do so. But maybe, in addition to the eternal life my faith promises me, I can live on in what I write in the books I’ve read. For me, that means that writing in the books I read adds great value to the books; it doesn’t destroy the value. Helpful post. You should see the looks of horror I get when I right in the margins of my bible in the ways you have described in you blog above. The new electronic Bibles are perfect as I’m no longer limited by the margins in terms of the comments and questions I can ask of the test.